Adelaide Raised Garden Beds, raised vegie beds, raised vegetable garden. 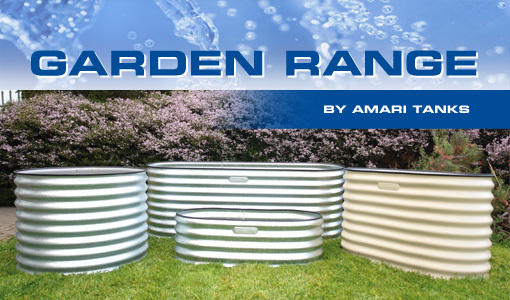 Amari has released a stylish new range of Garden beds available in a variety of different shapes and styles that can accommodate for your domestic needs. Each garden bed is made from Z600 steel or can come in Colour Bond if desired to match your surroundings. Our corrugated garden beds can be fitted with a plastic base which is positioned halfway between the internal walls. Your new garden bed will need less soil, so you won't waste water and it will also be much lighter for easy manoeuvrability. NEW PATIO RANGE NOW AVAILABLE! Our exciting new Patio Range of Garden Beds are now available to order. The Patio Range is available in an 1100mm Long Full and Half Height as well as a 2100mmLong Full and Half Height. They are fitted with a plastic base which is positioned halfway between the internal Walls which will mean your Garden Bed will need less soil, so you won’t waste water and it will also be much lighter for easy manoeuvrability. Drainage kits can also be fitted to allow your customers to place their New Patio Garden Bed directly on Timber Decking or on Pavers. 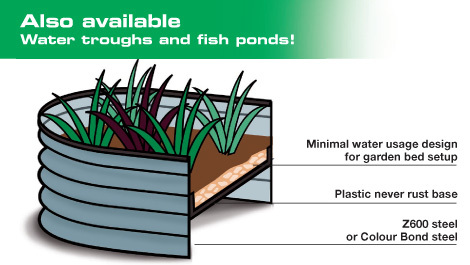 This Range can also be used as Water Troughs and Fish Ponds. Coloured Garden Beds NOW ALSO AVAILABLE! Amari is also pleased to announce the introduction of Colour to our range of Garden Beds. The first Colours to be available are WILDERNESS GREEN and SMOOTH CREAM. *Please note: Smooth Cream is only available in our previous heights of 300mm High and 650 mm High. Wilderness Green is available in our new heights of 800mm High and 400mm High! For further information, please call Amari Tanks on 08 8262 4060. DK-1100 Drainage Kit for 1100mm Garden Bed (1 Hole and Tap) Fitted. DK-2100 Drainage Kit for 2100mm Garden Bed (2 Hole and Tap) Fitted. IMPORTANT NOTE: Amari use 0.6mm steel sheet with a Z600 Galv coating for superior strength and durability.